From the residential studio in Surrey I got a job as junior engineer at a long established studio in Wimbledon. It was a peach of a job, because at the time most of the studios were moving, if they had not moved already, to using freelance engineers. This left engineers at the whim of the record label, or producer, or whoever decided these things. You could be ‘flavour of the month’ for a while then be displaced by another favourite of the moment, suddenly finding yourself scrabbling around for any work that was going. Getting work in these circumstances involved constantly having an eye out for chances, and all sorts of genuflection and insincerity, a field I’ve never been good at nor wanted to play in. Getting the work was a job in itself. At this studio however, it was just a matter of getting on with it, and you did whatever came in. I’d agreed to turn my hand to maintenance if needed, but my duties in this regard were light, since the studio had just been fitted with one of the first SSL Total Recall desks. My boss, the Chief Engineer, was a good bloke and I earned his eternal gratitude by fixing a dry joint in the Lexicon digital reverb which had been plaguing the studio for months. Much of the material was chart stuff, with artists that aren’t particularly noteworthy now, and a consequence of this was occasional frantic rush jobs for Top of the Pops . The Musicians Union insisted that any song on TOTP had to be recorded again specifically for it, the grounds for this are vague now but the intention was obviously to create work for their members. If the single featured strings for example (we once had practically a whole orchestra in) it was an even bigger undertaking. Starting at 10am we had to have the final mix out of the door in time for the programme that same evening. 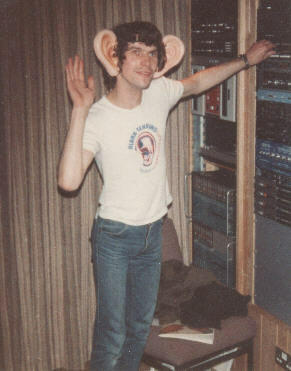 So it was ‘all hands on deck’ for such sessions, and I was told that sometimes tapes had been swapped when the studio and band hadn’t been able to make the deadline. The changeover would be accomplished away from the watchful eyes of the MU representative who would hang around to check that the rules were being adhered to. 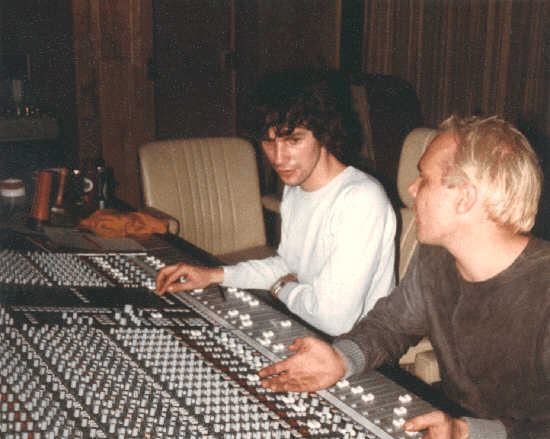 Sometimes people would come in and see the sea of knobs on the desk, the tape machines and all the rest of the high-tech gear and think you could make them into a star – you could see it in their faces. Of course you couldn’t do any such thing – you could enhance the sound, but ultimately you could only record what was coming in to the desk. Outside the studio, on the television screen in the lobby, the Falklands War vied with Wimbledon as the latest spectator sport. It wasn’t long before I was doing sessions myself and one incident has stuck in my mind. The most unremarkable sessions, of course, are the ones where everything goes swimmingly and there’s really not very much to say about them. I was recording an album for a band, Airstrip One, and we were doing overdubs. There was some sort of crowd chorus and they persuaded me to take part, overruling my objections that I was needed at the desk by offering to press the right buttons at the relevant time. They were a good-natured lot. I, unfortunately, had fallen into a bad habit of using the SSL record button (the big lighting red button near the centre of the channel) as a channel marker. This was safe to do providing the track wasn’t set to ‘Ready,’ since I always used the machine remote for drop-ins. Needless to say, this bad habit of mine was quickly shed thereafter. We did the overdub, and had a laugh about me being on the track, only to discover that somehow a hole had been punched in one of the guitar tracks. There was nothing for it but to patch it up with a brief overdub there and then. Once, at the Virgin studio, I had been called in to help in the recovery of a piece of 1/4” tape, little more than one inch long, which had accidentally been snipped out. The engineer (I think it was Padgers) set to restoring the equalisation and other settings to recreate the sound, while I and another dug through the waste bin at the back of the control room, pulling out bits of tape, wiping off the fag ash and splicing them whole (no further cuts allowed) onto a reel so they could be played back on one of the ATR’s and checked. Finally the two separate teams reached the required goal within seconds of each other – the engineer announced that he had the sound within moments of us finally salvaging the correct sliver from the waste bin. The point is that when mishaps occurred, as it was inevitable they would sooner or later, the important thing is not to get frustrated or angry but muck in to restore the damage there and then, if at all possible. My favourite story of this period though is of the occasion I did a drop-in in my sleep. It was three or four in the morning with a keyboard player on the other side of the desk wanting to insert a tricky phrase. He was having a little difficulty with it so I had set the autolocator to cycle round and round over the section while he practiced it, although as usual my hand was poised over the tape remote. Then I must have – well, did – nod off, as there was nothing for me to do except wait for him to perfect the phrase. So when he said something like “I think I’ll go for it now” the part of my brain programmed as “tape-op” sprang into life and I did the drop-in, and moreover a tight drop-out, before waking up and insisting that “Sorry, I missed it.” I hadn’t missed it at all, because the proof was there on tape. I had done it in my sleep, or certainly what Pavlov called hypnosis. The big dilemma at this time was that while being unemployed I had applied for a place at Sussex University to study mathematics, and I had been told that I had been accepted. Should I go or should I stay? I met Nick, he who engineered PiL, in a fashionable pub in Notting Hill one night (it had a glass window in the floor, I remember) and asked his advice. Maybe he was the wrong person to ask, I don’t know, but he advised me to get out of the music business and go to university. From my job in Paris the lesson was vividly learnt that if the man at the top is no good, you’re wasting you’re time trying to change anything because he will undo any good you do. Another important matter is the danger of loud monitoring – there is no evolutionary precedent for the intense sound levels amplification can produce, just as there is no evolutionary defence for the powerful opinion-moulding effects of television. I’m sure there are many aging rockers now who are as deaf as a post. “Loudness” is a bit like “fitness” in biology – there are many definitions, according to the context. A transistor radio or cheap stereo turned up high sounds loud because it is distorted, but the most dangerous sound is from a clean, high-powered system delivering high peaks without compression or distortion. Writing these memoirs has led to memories coming back not only of interesting encounters and experiences but also to some (probably unhealthy) self-recrimination for some of the daft things I did during this period. For example, at my last studio I went too far exploiting “down time,” using dead studio time to record the band of an old friend who had helped me a great deal, unpaid, in the restoration of the house in Hull. On one occasion I brought the band into the studio for an overnight session, but we over-ran. Over-running sessions are, of course, not unusual in studios but in this case the “clients” with whom I was struggling to finish off weren’t supposed to be there, while the people waiting to start their session were paying customers. The outcome was that my friends and I were still in the studio when the other studio staff arrived in the morning, resulting in the Chinese accountant hopping with rage and threatening to call the police to have me removed, while the Australian band who were booked in for the daytime session wandered off for a second breakfast in the greasy spoon café down the road. Eventually I managed to wrap up the session, bundle my friends out of the side door and follow to the café to tell the Australians that the coast was now clear and their session could begin. They were great about it, and were by this time firmly established in the café. A sense of normality at last returned as over tea and bacon sandwiches I was regaled with jokes about hairy lassoos and fur-burgers. The sight of us laughing together as we returned from the café and headed straight into the studio to start work was probably the only thing that saved my job. All this turned out to be for nothing because my friend’s band split soon after. It could be said that those who claim not to have any regrets must either be devoid of conscience or in a state of denial – certainly many people have a memory that is kinder to themselves than mine. Whatever my sins (or probably more accurately, stupidity) I console myself that they are as nothing compared to the execrable jungle noise the music industry is currently inflicting on the population. Some white people claim to like it, but in reality this only demonstrates how malleable to invented fashion they are. If I had not left studio work to go to university everything would have been different. Who’s to say what would have happened? After recording Dexy’s Midnight Runners and others, no doubt my name would have appeared on the credits of lots of albums. Trying to explore the infinitely branching possibilities is enough to drive one mad. It is highly unlikely that there would now be Procedural Analysis, or a Heretical Press, and very doubtful that I would be facing eighteen criminal charges for making people think and laugh about things they’re not supposed to. Did I do the right thing? The reader can decide.